I received this product to review and I have NOT been paid. Opinions expressed are 100% my own. I’ve used this for a week and I haven’t seen a difference around my eyes at all. I still have dark circles, puffy eyes and wrinkles. I have sensitive eyes and skin and the only positive thing I can say about this product is that it didn’t irritate my skin or my eyes. The product felt really cool and nice under the eyes and it didn’t bother me in any way. That being said my dark circles and wrinkles are still there and the product didn’t change anything. Keep in mind I only used this product just over a week, morning and night. I will continue to use this product because the results might have to do with the longevity of product use. I’m not sure to be honest. I will keep you posted. “Experience The Most Effective Eye Treatment Designed To Eliminate Dark Circles, Puffiness & Wrinkles! Behind The Science: Our eyes say a lot about us. Lack of sleep, a proliferation of stress, a poor diet can all affect the way our eyes look. Puffiness, bags, and dark circles do not show us at our best. Also, sun exposure and the inevitable aging process contribute to crows feet and even wrinkles on the upper lid. 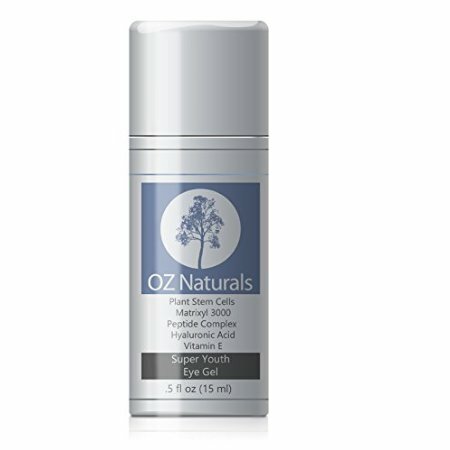 This is why OZ Naturals has created Super Youth Eye Gel. Its an all-natural product designed to give you real results.